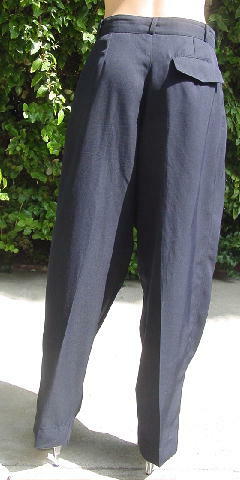 These black 100% polyester vintage pants are by Sakai Paris. They have a 7" long zipper fly, a 1 3/4" wide waistband with a one black button closure, and belt loops. 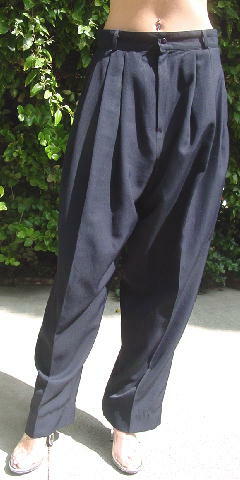 There are pleats in the front with side slit deep pockets with black faux leather edging. They have a wide leg styling and a back pocket with a flap. They're from a larger size model. waist to hem 43 1/2"
leg opening side to side at rise 14 1/2"